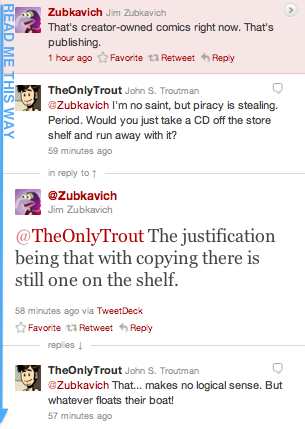 The old “you wouldn’t take a CD off the shelf” canard comes out and Jim gives the obvious rebuttal. I’m just including this because I love it when people acknowledge the validity of different angles on one problem. 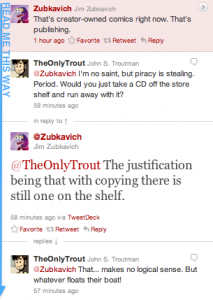 Also until I read these two comic creators using it, I had never understood the physical analogy at all. I still think it’s a bad analogy, but I actually get it for the first time.